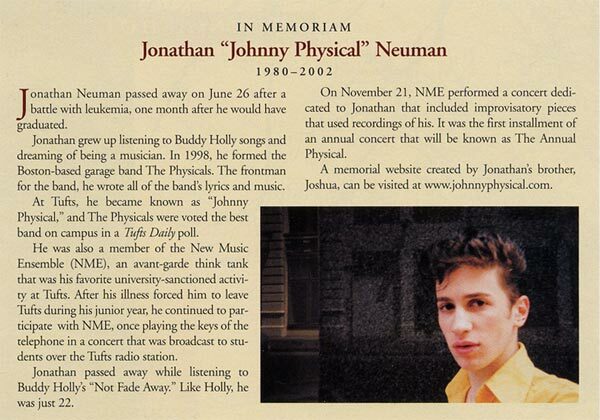 Jonathan Neuman lived from February 19, 1980 to June 26, 2002. As a little boy growing up in suburban New Jersey, he would fall asleep listening to Buddy Holly’s songs and dream about becoming a rock star. As a teen, he broadened his musical horizons by listening to the free form, independent radio station WFMU. Though his musical tastes would soon range from classical and early country, to the blues, he was especially in love with the early punk that sprang from New York City in the 1970s. He taught himself how to play the guitar, bass, and drums and spent many a night producing his own music in the makeshift recording studio he set up in his parents’ basement. On weekends, he performed at open mic nights at a café in Montclair, NJ and gravitated to Sidewalk Café in New York City, where the anti-folk music scene was just burgeoning. In rooms with less than a dozen or so people, he watched Daniel Johnston, Jeffrey Lewis, and The Moldy Peaches, befriending the latter band’s leader, Kimya Dawson, in the process. When Jonathan started college in 1998 he founded the garage rock band, The Physicals. Jonathan wrote all of the music and lyrics, and as “Johnny Physical,” became the face of the band. Between 1998 and 2000, The Physicals played at Tufts University and along the East Coast of the U.S., playing on the same bill as The Recoys, Enon, and Kind Congo Powers. While his pompadour and black-rimmed glasses were a tacit nod to his childhood hero, Buddy Holly, his music reflected his major influences: The Ramones, The Stooges, T-Rex, The Velvet Underground, and The New York Dolls. The Physicals were voted the best band on the Tufts University campus and Jonathan found himself developing a small cult following. Jonathan’s life forever changed when he was diagnosed with leukemia in October of 2000 and started treatment at Memorial Sloan-Kettering Hospital in New York City. In the midst of chemotherapy, he staged an acoustic event, “Johnny Physical: Plugged” for friends, family, and fellow patients. During intermittent stays in the hospital, Jonathan continued to compose and record music—frequently from his hospital bed. He developed a legion of admirers, including Ari Up! of the iconic punk band The Slits, Miss USA Kandace Krueger, and famed documentarian Albert Maysles (who interviewed Jonathan for a series he was working on for PBS). After a year and a half of treatment, Jonathan developed a lung infection and passed away at New York Hospital. The last song he heard was Buddy Holly’s “Not Fade Away.” Like Buddy Holly, he died at the age of 22.